The Las Olas Altas Beach is the best known beach in Mazatlan and is close to the historical center of the city and the boardwalk is a popular place to enjoy the coastal views by night as locals enjoy being outside in Mazatlan and take their entire families for a stroll along the beach and a bite to eat. 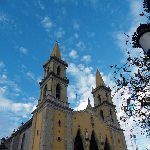 In the center of Mazatlan you must visit the beautiful Church El Centro Mazatlan which you will also find in my photo gallery below. As for dining in Mazatlan Pancho's is the best place to go as seafood is amazing, the staff speaks perfectly english and very attentive! Their Flan de carmella is to die for..
Did you enjoy Holiday in Mazatlan and have you been on a holiday in Mazatlan, Mexico? Where to eat in Mazatlan: The local markets are great and great restaurants are also to be found all over town. Pancho's was our favorite!